If we draw a line through the year 2001 on our evolution trend graphic it slices though the layers of every control technology known to man. Part of the message we received from our education sessions in Atlanta was "give us more information sooner, and for different levels of expertise." This seemed like a goal that our mutual magazines should have no problem helping out with. To try to get a handle on this task I have created a graphic depicting Automated Building Evolution. Once completed it became very clear why there might be a cry for education. The Automated Buildings evolution follows the growth of the pneumatic control industry for a century seeing the gradual introduction of pneumatic transmission, electric and electronic control. In the mid 1960s electronic control evolved to multiplex control systems that rapidly evolved into head end computers that quickly gave way to mini computers and then it quickly ended with the personal computer and the DDC revolution. The Direct Digital Control revolution hit in the late 70s and early 80s. The use of DDC exploded, greatly expanding the scope of the traditional building automation control market while displacing the traditional pneumatic control industry. 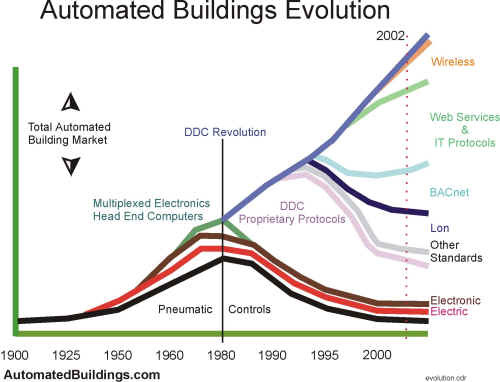 The Automated Building Control growth curve went almost vertical. The period between mid 1980 and mid 1990 saw the growth of many new control companies. These new companies were able to bring low cost, high functionality, proprietary protocol control systems rapidly to the market place. By the mid 1990s the cost of DDC was much lower than the cost of pneumatics. This rapidly fuelled the replacement of pneumatic controls and the expansion of traditional and non-traditional automation markets. About the mid 1990s the BACnet movement began to gain momentum and a few systems were built around the evolving standard. At a similar time our industry started to follow closely the Lon revolution that was occurring in other industries. Standard protocols had become something the industry wanted to achieve. Slowly but surely the proprietary communication standards were being driven back and replaced by standard communication protocols. The next revolution to hit was Internet/Intranet and browser based presentation of everything. This forced all companies to look hard at what the Information Technology or IT industry was doing to standardize presentation models. Some companies had built their new systems around IT thinking and were able to rapidly follow and even lead this new trend. Once DDC concepts were embedded in browser base presentation, convergence fuelled the rapid evolution towards wireless interfaces and emailed alarms. With the rapid evolution, exploration and increased understanding of the complete power of the newly inherited web environment, Building Automation Functionality exploded. If we draw a line through the year 2001 on our evolution trend graphic it slices though the layers of every control technology known to man. These control technology layers are sprinkled with hundreds of annoying acronyms and all the layers are converging and interacting, plus completing for prominence. So why are the casual control types having a problem keeping up? If you look at our graphic the curve has gone almost vertical. What they have to learn to understand today's Building Automation industry is written on a curve that appears as a wall layered with every control technology we have ever invented. Without reference to how we came to be here it is just that, a wall. The last layer may be the only chance we have of explaining ourselves. Information Technology or IT solutions abound and everyone must learn the power of browser-based presentation to move forward. The ability of browser-based media to allow us to move in multi directions rapidly at our own pace is the tool we need to analyze the information wall. In the next few months, with the assistance of the automation industry, I am going to improve our online education with linkage to existing on line education. We will provide a vehicle for those wishing to better understand our present Automated Building evolution. I am going to provide information at various levels, especially the concept level. We have a strong need as an industry to conceptually project our direction. Well-understood concepts will allow our industry to be better integrated into evolving .com and virtual data buildings now under design. Great quantities of information exist on the net about the annoying acronyms that have us talking funny. These acronyms are evolving into standards and the standards are changing how we conceptually present ourselves. More understanding is required by us all to move our industry forward.